A special conference is taking place focusing on challenges faced by women refugees in Northern Ireland. Voice of Change is being run by the Northern Ireland Community of Refugees and Asylum Seekers (NICRAS). Representatives from the English and Scottish Refugees Councils are also taking part. It is looking at issues such as access to healthcare, jobs and housing - made more difficult by the lack of a power-sharing government at Stormont. Northern Ireland has been without a functioning devolved government since January 2017, after a row between the main parties over a flawed green energy scheme. Northern Ireland currently does not have a refugee integration strategy and it is one of the few remaining jurisdictions in the UK without one. Local refugee support groups say it is difficult to find exact figures for people seeking asylum in Northern Ireland, because the Home Office rarely issues regional figures, and does not take into account those awaiting to hear if their applications have been accepted. In 2015, the Law Centre NI estimated that about 600 people were seeking asylum in Northern Ireland and were living in supported accommodation. Those coming to Northern Ireland were from places like Iran, Nigeria, Zimbabwe, Somalia and Albania. A separate relocation scheme for refugees displaced by the crisis in Syria has been in force since 2015. In December, it reported that there were now more than 1,200 Syrian refugees living in Northern Ireland. What are the challenges refugees face in NI? Embrace NI, which helps minority groups in NI, says there are particular issues of concern. Often refugees arrive in Northern Ireland speaking little to no English, so the language barrier can present difficulties in developing a "normal social life". It also cites poverty as a problem, as most people arrive with only the clothes they are wearing. They are allocated accommodation in the private rental sector and a small basic weekly allowance (a flat rate of £36.95, as of December 2016). There can also be issues with the quality of housing, as well as getting access to healthcare and employment opportunities. In some cases, qualifications refugees had earned in their home countries are not recognised in the UK, meaning it can be difficult to get a job in the same sector they worked in before. 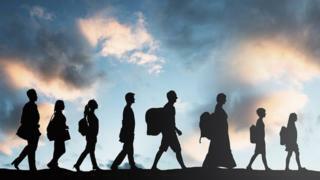 What are refugees and asylum seekers? A refugee is a person who has been forced to leave their country in order to escape war, persecution, or natural disaster. An asylum seeker could be a combination of all of the above, although they are asking for international protection in another country. EU rules allow a country such as the UK to return an adult asylum seeker to the first European country they reached. Asylum seekers often say they want to come to the UK because they want to speak English, and because they have family connections in the country. Mimi Unamoyo has been living in Northern Ireland since January 2009, when she arrived from the Democratic Republic of Congo. She now helps women refugees coming to Northern Ireland, and will be taking part in the conference on Thursday. "In the beginning, it was so difficult for me, life was so horrible," she said. "Coming into this situation is not an easy life, I spoke no English - just 'Hi, how are you'. Basic phrases only." She said the language barriers made job opportunities tough at first, but now she has adjusted well. "Northern Ireland for me looks like home - I love it," she said. "I'm not sure if today I could go back to my home country, now Northern Ireland is home for me."